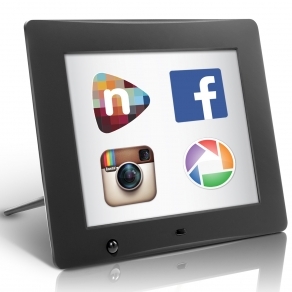 Digital photo frames are a wonderful way to display your family memories without having to take up a ton of space. You don’t even have to worry about organizing them, just upload your photos and put it on slideshow and voila you’ve got an amazing album. Better yet you don’t have to have several photo frames all over the house because just one can hold so many pictures! Our Ultimate Cloud Frame is like nothing you’ve seen before – with just the click of a button you’ll be able to free your photos from the Cloud and easily manage them in one place. This one-of-a-kind Frame comes with it’s own unique login to our nixplay program allowing you to securely access any of your personal photo collections. 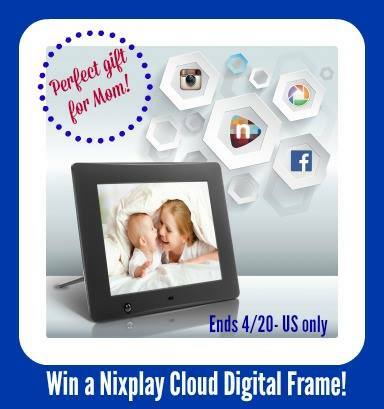 One lucky winner will get the nixplay W08A Wi-Fi Cloud Digital Photo Frame. I don’t have kids but do have nieces and nephews that i love very much.my favorite one’s are them opening x-mas gifts . MY FAVORITE PICTURE IS MY GRAND-DAUGHTERS WEDDING OF ME AND HER…. My sons Kindergarten Graduation Picture! I <3 it!! One of my favorite pictures of my children was taking while our family was playing disc golf this winter. Both girls are smiling and look happy! One of my favorite pictures is one of my husband and two kids walking hand-in-hand on the beach while we were on vacation…it’s precious! Thank you for the giveaway!! One of my favorite pictures is of our family on Christmas this past year. my favourite picture is their first taste of snow. I have a picture of my three kids where my daughter has on her cheer leading outfit and both my boys are in their football uniforms! So adorable! My favorite picture of my little girl is of her feeding the ducks. She is all dressed up and looks so happy 🙂 She loves this picture too. I love looking at older photos of my childen and seeing how much they have grown. I love the older photos cause they have so much memories behind them and just remember the day I took them .. I am not a mom or a grandparent. So my fave pic of my cat is the one on my avatar. I would give this to my MIL if I won. Thank you for this chance to win. PHOTOS WITH GRANDPARENTS, THAT CANNOT BE REPLACE. BEAUTIFUL MEMORIES. Those are awesome memories to have. The girls at the Ingalls Homestead. I love the picture of my kids from our recent trip to Walt Disney World. The two of them on the couch with arms around eachother. My favorite picture is of my husband of 42 years and me holding our new granddaughter born on Jan 1 this year. I love classic rock n roll. I like classic country music. I like 70s and 80s and country! I listen to a lot of music, but I’d have to say my favorites are alternative rock and metal. I would love to win this to put Grandkids picture in,thanks for the chance.